The tradition rich Swiss watch brand, Milus, creates the woman’s mechanical watch MEREA TriRetrograde Seconds Skeleton' as a heavenly 'Joaillerie' variation. Scintillating precision emanates radiantly and consummately from the MEREA universe. The extravagant MEREA line for women takes its name from the star Mira, whose brightness varies regularly. In keeping with the MILUS philosophy, the elegant MEREA watches reflect this changeability in an almost playful way. After the successful launching of the MEREA 'TriRetrograde Seconds Skeleton' last year, the MEREA 'TriRetrograde Seconds Skeleton' Joaillerie with sparkling brilliant-cut white and black diamonds has now made its appearance in the MILUS universe: a magical combination of superb jewelling artistry and masterful Swiss watchmaking tradition, a watch that captivates with its ethereal lightness. The enchanting design of the watch is gracefully united with its mechanical perfection. The fascinating retrograde seconds function is housed in a dynamically contoured, three-part case in 18-carat white gold. The real eye-catcher is the stunning dial, which is breathtakingly inset with white and black diamonds. The exquisite decoration elegantly extends from the dial onto the bezel, the bracelet attachment elements and the large-dimension crown, resulting in a charismatic piece of jewellery that scintillates like a star. The oval, lightly curved sapphire crystal reveals striking perspectives in the artistically designed dial of the MEREA 'TriRetrograde Seconds Skeleton' Joaillerie. This is realised in three different layers. The movement base has circular graining decoration. The second level is coated with an iridescent layer of mother-of-pearl that conjures up a discreet interplay of colour. On the third one, precious white and black diamonds adorn the dial. In front of the backdrop of the seconds display segments in sparkling diamonds, the three silver-coloured seconds hands that jump back in turn after 20 seconds perform a graceful ballet. Positioned at 6, 10 and 2 o’clock, they work clockwise in 'flying relay'. The precise rhythm of the jumping seconds hands is provided by a Swiss quality mechanical movement in an exclusive special version with automatic winding. The dial allows a view of the two hand-engraved mounting pieces that support the seconds hands. 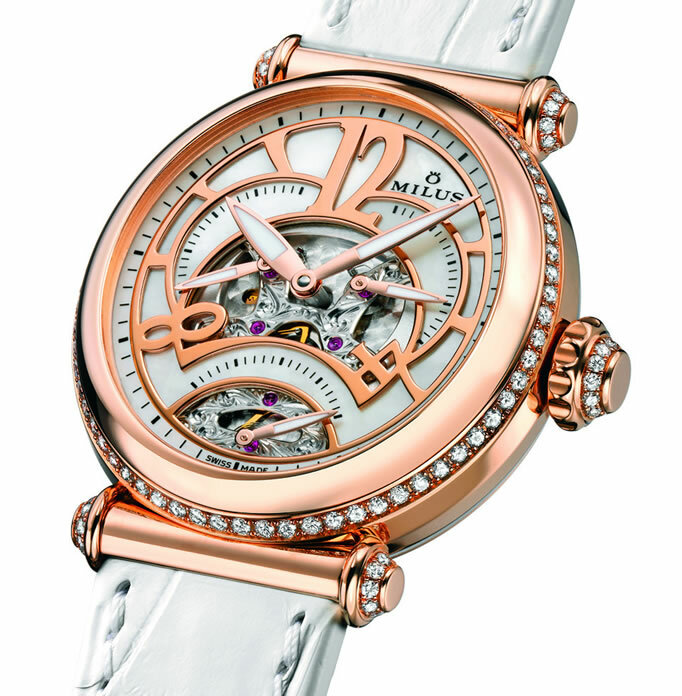 This impressive women's watch also shows its uniqueness on the back, with a round sapphire crystal viewing window in the screwed-down case back allowing a look at the movement and the skeleton oscillating rotor in the form of the MILUS logo. The black galuchat strap exquisitely rounds off the elegant appearance of this peerless women's watch. The MEREA 'TriRetrograde Seconds Skeleton' Joaillerie celebrates the preciousness of each and every second with consummate finesse.